Following last year’s successful get-together in Stratford-upon-Avon, we’re really pleased to be announcing the next such event onn the 27th of April 2019 (Saturday), at the Parc Floral de Paris. Join us as our member Patrice Barboutie, curator of the Pelargonium collection at the Parc Floral, takes us on a guided tour of the exciting, superbly grown and internationally renowned collection. 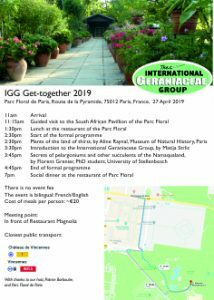 Following the tour, we will be invited to the lecture hall of the Garden for a progamme of exciting talks, one of which will be by Florent Grenier, the 2018 IGG small grant awardee. We will end the day with a social dinner close by. Please register your attendance by responding to the corresponding Forum announcement. If you are a member of our Facebook Group, you can also register your interest here. The detailed (printable) programme is now available on our events page, or by clicking on the tumbnail below.